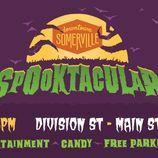 Community event presented by Somerville Recreation. Enjoy music, activities, and entertainment on Division Street, Main Street, and at Borough Hall. Participating merchants will be handing out candy to trick or treaters! Free parking in lots 1, 2, and 4 as a treat for parents. Rain or shine.